Great location in the heart of Pinetop! 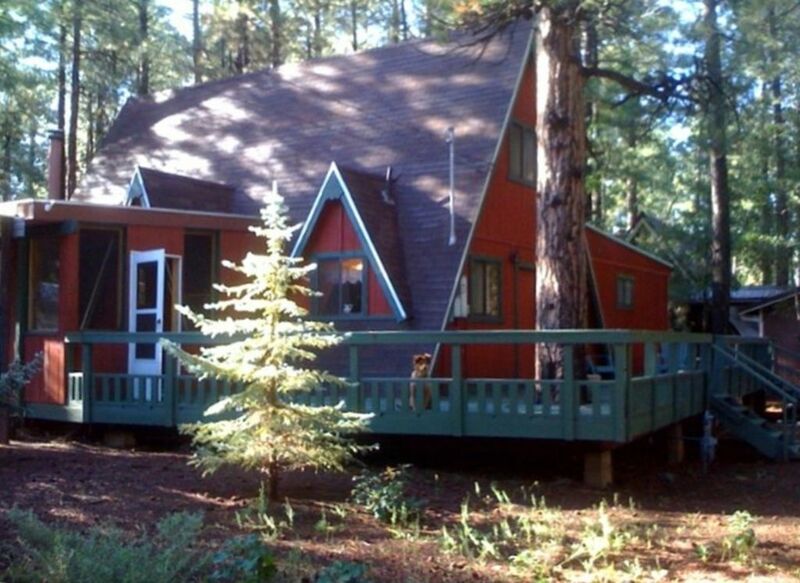 Cabin is nestled in a quiet wooded area with big ponderosa pine trees. The property is now completely fenced in so bring your four-legged friends! Less than a mile to local favorites, Brickmans (casual and fine dining), Charlie Clark's Restaurant and outside Barn Bar (with firepits and live music ), Eddie's Country Store (great smoked meats and novelty jams and sauces), and the famous Red Devil Pizza Place. Cabin is less than 3 miles to the famous Hon-Dah Casino, endless antique shopping and 30 minutes to Sunrise Ski Resort. Come rejuvenate and relax in the best kept secret in Arizona... the majestic 'White Mountains.' Just 168 miles from the valley and you are surrounded by the largest stand of Ponderosa Pines in the world! Cabin features all brand new furnishings and amenities, 2 wood burning stoves for that winter ambiance, 1 gas stove and base heat. Cabin has HUGE master bedroom with master bath and its own wood burning stove. There are two additional bedrooms upstairs with a queen bed in one room and two single beds in the other. Full kitchen complete with microwave, coffee pot, pans, serving dishes, and utensils. Two baths with separate dressing area inclusive of a full-size washer and dryer. The rustic lodgepole furnishings throughout and charming decor is sure to enhance your mountain get-away. Owner took really good care of making sure things were perfect for me. I enjoyed the place, had an excellent time and accomplished my goals of self care and charging myself with new energy. Comfortable, safe, quiet and wonderful area, would recomend to anyone who is looking to rekindle themselves, and want quality time with family. Location was perfect. Had lots of snow that just added to the charm andcoziness of the cabin. Great place with plenty of sleeping room! Fenced yard was nice for the dog!!! Overall we enjoyed our stay. However, we ran out of every essential required...toilet paper, tissues, paper towels. The place should be stocked with extras to avoid having to purchase this. We didn’t use excess amounts or anything. Also, the main fireplace doesn’t work and it would have been great to be able to use it, especially since the electricity went out for hours while we were there. The master bed was also very small and the sheets didn’t fit. We supply plenty of starter rolls of toilet paper & paper towels for your stay. We also supply soap, hand soap, laundry detergent, baggies, tin foil, garbage bags, spices, paper plates & napkins. The fireplace in bedroom wood burning works & family room has BOTH wood burning (not work) but gas fireplace....3 feet away does work. Master bed is a Queen. I loved this cute cabin. The owner was very responsive and answered all of my questions. The yard was perfect and it was so peaceful and quiet. Thank you for a great weekend! We will be back! We just loved the cabin. It was as cozy as expected. Our dog loved it so much too, thank you for making us feel welcome.